← Sleeveless In a Summer Vest? The morning after a storm is always cool enough to have a cup of coffee on the new porch. Which is needed since the dog, deathly afraid of thunder, pants and drools on my head all night. Do many of you wear white trousers in summer? I live in them. These are a wool and linens blend with an open weave that lets through every breeze, I left them unlined, so they can be a bit see-through, which is why it is essential to have a blazer in linen with a traditional length. The shirt is also custom from my tailor, Leviner Wood, and the tie is a silk shantung from Drake's. The whole veered into costume until I switched out the brown and white spectators for the brown loafers by Peal and Co., via the Brethern Brooks. 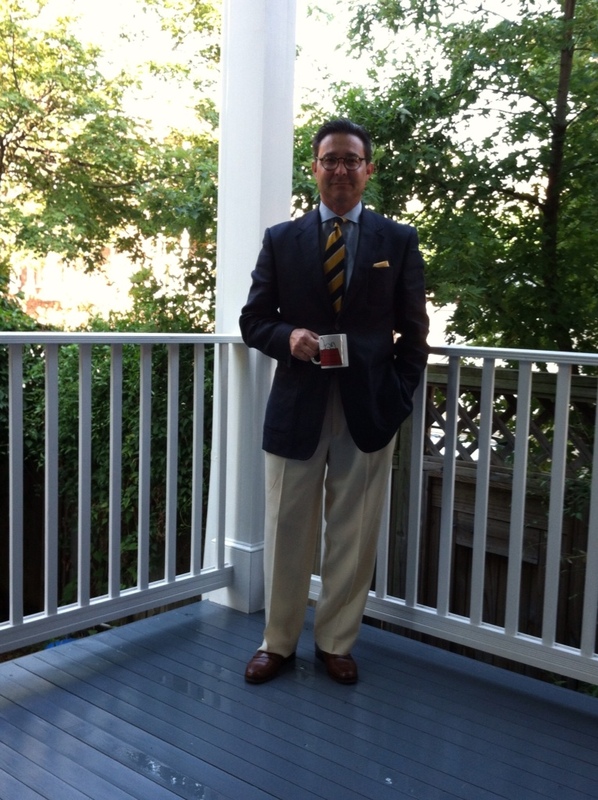 This entry was posted in Elegantology, Uncategorized and tagged brooks brothers, Drake's, leviner wood tailors, peal and co, shantung silk, Spectator shoes. Bookmark the permalink. Great outfit Chris. This weekend I will be looking for a pair of cream colored trousers. Now, if I can just find a light weight blue blazer, I will be set. Are those pants really while or more cream in color? Thanks TK, they lean more towards white in my opinion, but not blindingly so. Nice look, I’m all about the white pants in summer, they’re cool, they look sharp and they’re hard to keep clean, what more could you ask for. I have several pairs and have started wearing them with navy shoes, espadrilles for a more casual look and my navy velvet with gold seahorses slippers from Stubbs and Wooten for a more formal look (warning to do not try this look if you don’t want to attract attention) they’re comfortable and they’re fun, give it a try.